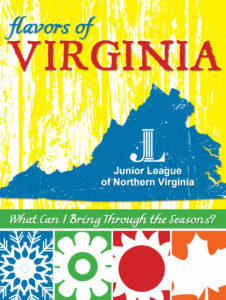 The Junior League of Northern Virginia (JLNV) is excited to announce the launch of our second cookbook, Flavors of Virginia: What Can I Bring Through the Seasons? This brand new cookbook features personal and family recipes submitted by League members and showcases local favorites and seasonal flavors, highlighting the bounty of fresh foods grown in Northern Virginia. Junior League cookbooks from across the country have a storied history, and are a great way to raise awareness of the League’s mission and raise funds to support the communities we serve. Our inaugural Junior League cookbook, What Can I Bring? has sold more than 35,000 copies since it was first published in 1999. We are excited to bring this new cookbook to our community to support the important work of the JLNV. 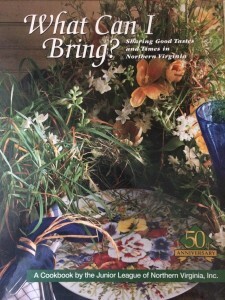 Click here to order Flavors of Virginia: What Can I Bring Through the Seasons?. In addition to our new cookbook, we have limited copies available of our inaugural cookbook, What Can I Bring? as well as other Junior League cookbooks from around the country. Interested in selling our cookbooks in your place of business? Contact us at cookbook@jlnv.org to learn about wholesale pricing and how you can help make an impact in the community. For more information, email us at cookbook@jlnv.org.